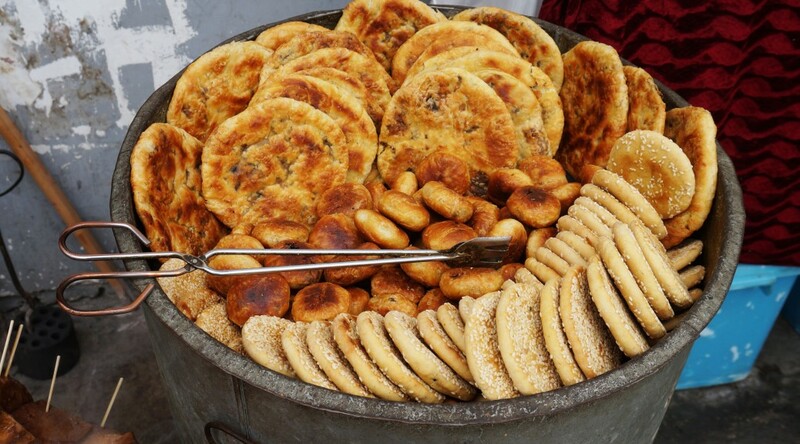 Niú Ròu Xiān Bǐng (Chinese: 牛肉餡餅) are savory snacks served throughout the day. They have golden, crisp crusts and a juicy, fragrant beef filling. First, the dough is made from flour, water and salt. The meat filling consists of ground beef, scallions, egg, soy sauce, sesame oil, black pepper and white pepper. The ground beef is marinated with all of the spices, soy sauce, and onions and allowed to sit for the flavors to meld together. The flour, salt, and water are mixed together to form a dough. On a floured surface, the dough is kneaded, rolled out, and divided into circles. The seasoned ground beef is placed in the center of the dough and pinched shut. The pastry is then flattened and fried in a heated and oiled shallow pan on medium-low heat. Once both sides are golden brown, it is ready to be served. According to legends, niu rou bing originated from the Tang Dynasty during Xuan Zhong’s reign. The story relates to his discovery of shao bing when he was fleeing with his imperial concubine Yang Gui Fei and tried one on the street. One day he disguised himself and went to the streets of Xi’an. He saw a small shop lined with hundreds of people waiting with cake in their hands. The emperor was lured into line by the delicious smells, and found out that everyone was waiting in line for niu rou bing. After waiting in line and ordering two, he ate the first one so fast that he didn’t even know what it looked like. He saw the second one and realized that it looked like the moon. After, he couldn’t forget the store or the memory of the food, so he often went back to buy and eat it. A famous poet named Bai Juyi of the Tang Dynasty also wrote a poem about niu rou bing called “Send the Pancake to Yang Wan Zhou.” In it, he appraises how delicious the pancake tastes when it is freshly made, and sends it to his friend.